The approach taken in this tutorial got deprecated by google as of 29th January’19. I have published an updated version of this tutorial. Please click here to check the updated version. I am back with a blog on android after quite sometime. This post is about Android Google Places Autocomplete feature tutorial with example. In today’s time in almost all the location based mobile application, we get feature to search location manually ourselves for various needs. The Google Places SDK for Android provides places autocomplete service. It returns predictions of places in response to the search queries entered by the user in the search box. User can keep typing what they want to search, and the autocomplete service keeps returning list of suggestions based on the user input. In this tutorial, we will cover the first one i.e. by embedding PlaceAutocompleteFragment. Programmatic implementation of place autocomplete feature – However, many a time when you want a great extent of customization in UI and user experience, the place autocomplete widget may pose some limitations. In such cases, we can implement the entire feature by ourselves. In this blog, we will concentrate on the option 1. 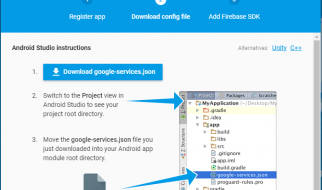 In order to use Google Places SDK, we need to register our app project in Google API Console. We also need to obtain a Google API key. We’ll then add this API key in our android app. Login to https://console.cloud.google.com/apis/dashboard with your google credential. As you type the project name, google will auto generate a Project ID. You may change it to your choice of id if you so want. I have not changed in my case. A new page will open up; search for Places API (refer to the below screenshot). Click on the Places SDK for Android. A new page will open up; click on the ENABLE button. Once clicked a new page will open up. Select the Credentials tab. Thereafter, click on Create credentials drop-down and select API key. In a few moment, a new API key will be generated. Copy and keep it safe. We’ll use this key in our application. If you would like to stop the misuse of they key, you must click on the RESTRICT KEY button and follow the steps. In my scenario, it’s just a demonstration and POC. Hence, I’ll skip this process. However, when you are developing to release a product to play store; ensure to restrict your key to stop misuse of your API key. Click on Next button. In the next window, select the minimum SDK version; you can choose as per your preference. In this case, I have chosen API 16: Android 4.1 (Jelly Bean). Click Next button. In the next window, select “Empty Activity“. Click Next button. In the next window, let’s keep the Activity Name and Layout Name to default. Click Finish button. We’ll also add following dependency for a better UI and wrapping the google places autocomplete widget. Now, we will add the API key in AndroidManifest.xml file. This is the key that we just generated from Google Developer Console. 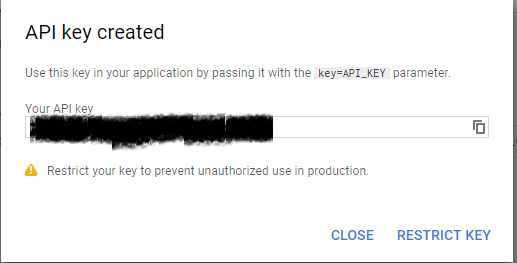 Replace YOUR_API_KEY_FROM_GOOGLE_DEV_CONSOLE with your own API key. Now that we have added the widget, it”ll show a cardview wrapping the autocomplete widget and also a textbox. So, at this point, if user types, the widget will show related suggestion based on user input. Next, we’ll also add few lines of codes to display what user have actually selected from the suggestion list. To do this, we will add few lines of codes in MainActivity.java. Well, that’s it. You can run the app in emulator or android phone itself and you will see that auto complete feature is ready. Thank you so much you have solved my problem thanks a’lot brother. Hello, thank you for sharing. I had trouble clicking on the search cardView. The following was returned to me: PLACES + API_ACCESS_NOT_CONFIGURED. Places SDK for Android does not appear for me. Hello.. please check this link. I think you have the same issue? The example you have given is depreciated. Notice: The Google Play Services version of the Places SDK for Android (in Google Play Services 16.0.0) is deprecated as of January 29, 2019, and will be turned off on July 29, 2019. A new version of the Places SDK for Android is now available. Could you please migrate with new library? Please let me know once you updated i am waiting forward to update.